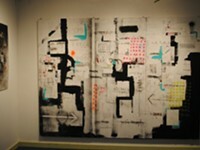 On the first Friday of every month artists and art enthusiasts are finding more reasons to stay south of Forsyth Park. This past Friday was a night that almost made you to forget that it was December. Almost. The only indication that it was indeed December and Christmas was, in fact, on its way was seen in the holiday decorations that went up throughout the city of Savannah. Desoto Avenue joined in the festivities by hosting the last Art March of the year in order to celebrate the art that was created in 2013 and to usher in the art to come in 2014. Nestled between Whitaker and Bull Street and only a few blocks from my house, this neighborhood is home to Maldoror’s Frame Shop, Graveface Records and Curiosities, and Vinyl Appreciation and this past weekend it shared its street with artists from all around Savannah. 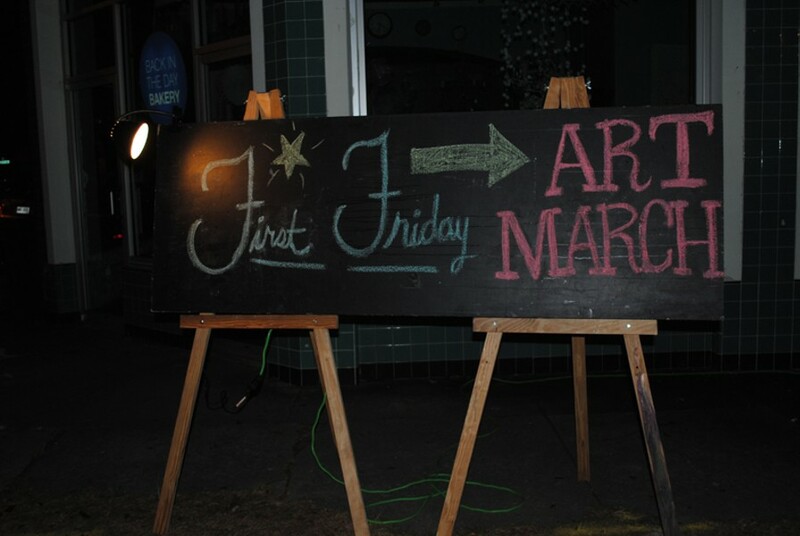 The above average temperatures made this Art March feel more like a summer block party than the last month of the year as Desoto Avenue came alive for another First Friday. After the sky grew dark and streetlights came on, a DJ spun the songs of Stevie Wonder on his turntable as children danced in the street or created their own crafts in the Kids Activity Area. People ambled down the street alone or with their friends reveling in another reason to celebrate the art and artists of Savannah. Lanterns were strung across the narrow street illuminating the tents and tables below where local artisans displayed their wares in an Indie art market. The shops and galleries along Desoto Row opened their doors to welcome those in search of the perfect holiday gift or in need of last minute stocking stuffers. There was something for everyone including landscapes of the low country by Lee DeLeo, Trichrome Designs by Patrick McNally, and prints by artist Lilly Harms. In between there was handmade jewelry and handcrafted soaps. There were even knives forged from railroad stakes with finely crafted hilts and paired with leather sheaths by Kevin D. Flowers. At Desoto Row Gallery the opening reception of Adam Gabriel Winnie’s Figuring the Self took place. 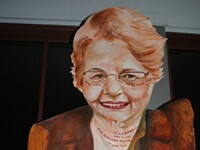 There, life-size charcoal self-portraits hung on the walls. One figure is suspended from a ledge while another stands on a pile of books, whose titles indicate years of studying art. Alongside of Winnie’s drawings are video performances “which explore the body’s relation with space and objects.” Within the small space of the gallery it was easy to understand his point. The holiday cheer spilled over to Drayton Street where boys greeted Art Marchers with guitars and songs that may not have been Christmas carols but they shared in the joy of the season nevertheless. In the studio of the AHA, where the work of Jared Seff was on display. Figurative paintings and portraits filled the room and the artist’s modern day rendition of a Thomas Eakins painting hung on the wall but Seff replaced boxing with mixed martial arts and a cage takes the place of a ring. More art was to be found inside in the gallery of the AHA, where Gary Covell exhibited his abstract art and artists of the Savannah Bazaar touted their creations in the Sanctuary of Anahata Healing Arts. Among the artists present was painter Jessica Sornson, who displayed her clocks made from used and rusted saw blades. Covered in lilac lines and cerulean swirls these blades are transformed from discarded objects to repurposed artifacts. Further down the street, Non Fiction Gallery showed their holiday spirit with a Pop-Up Show showcasing the works of recent graduates of SCAD and local artists. 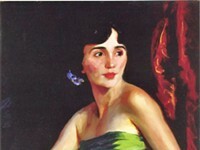 Despite the warmer than normal weather there was a makeshift fireplace inside the already cozy gallery where paintings were hung by the chimney with care in the hopes that avid art collectors would soon buy their wares. Walking along the streets of SoFo during the Art March it is easy to believe that perhaps this is the most wonderful time of the year. No matter what stops you made along the way the last Art March of 2013 demonstrated once again that art can be found right outside your door or just around the corner only waiting to be discovered, celebrated and shared. And as an inhabitant of this neighborhood I am proud to call this place home.